Ed. note: I am not a dermatologist, doctor, scientist, or astronaut. I am a rock climber who’s been paying attention to the different ways I hurt and fix myself for more than a decade. If you’re experiencing pain, you should probably talk to a doctor, not a blog. Rock climbing is hard on your hands. Chalk dries out your skin, pressure on sharp or super-textured holds can rub your tips raw, and one mis-placed pullup can rip a callus clean off. Today, we’re going to talk about preventing flappers, because I forgot all of this last week and have been paying for it since Friday. It doesn’t look like much but it ruined my day. I’ve been climbing for over a decade and I know better but sometimes it’s good to remind ourselves of some best-practices for skin care. Trust me – you don’t want to end up full of holes. When you’re climbing, you sweat. That’s cool – but sweat makes holding onto things tricky. So we use chalk to dry our hands out. This is great when we’re pulling on slimy slopers, but not so great when we consider what it’s doing to our skin. Folks will go ten rounds about whether or not you should use the Metolious Super Chalk with the special bonus drying agent; people are picky about their calcium carbonate. The point is, no matter what you do to your hands at the gym, give them some love when you get home. You don’t want your skin to be too soft, but you don’t want it to be too rough, either. Most conventional lotions are fine for use after you wash your hands (especially in the winter) or before you go to bed, but the last thing you want when you’re chalking up is greasy (but soft) hands. Plan ahead and keep your heavy-duty skincare away from the crag. If you climb (or lift, or work with your hands) often, you’ve probably got those nifty little hardened bits of skin on all of your fingers. Those are your body’s way of saying “look, I don’t like what you’re doing to me, but I’m going to deal with it by toughening up.” This is great, but those hard bits of skin aren’t attached by much, and when they peel away due to excessive use, they usually take the soft, friendly skin with them, leaving exposed nerve endings and shame. To keep this from happening, you need to make your calluses smaller. I use one of those files that are marketed for your feet, but let’s be honest – skin is skin. Just take some time filing them down at the end of the day (I usually do it while I watch Jeopardy) – but don’t file too hard. You want to keep the benefits of the tough skin without the risk of the big bumps. I also know some folks who use nail clippers to keep their calluses small, but this is risky – cut too deep and you’re in for a bad day. Once you’ve got them down to a manageable size, some sort of conditioner is smart, to keep the skin just a little more forgiving. We carry Mack’s Smack at Peak, but I’ve also used Giddy, Joshua Tree, and ClimbOn! balm with great success. Each product has its perks, but really it just depends on what you can get your soft and supple hands on (and what smells nicest to you). Rub a little of your chosen ointment into that tough skin, then sit back for Double Jeopardy while it soaks in. Ahh. These salves can be used on any sort of tricky skin, by the way – dry elbows, cracked cuticles, skinned knees – they’re made from all-natural products and designed for climbers (and other people who are hard on their bodies), so use liberally. Be mindful of your hands – it’s easy to forget about them until something awful happens. Well, you’ve got yourself a flapper, and it hurts. Get stoked for the most painful shower of your life, and then to be reminded just how much you use that part of your hand doing day-to-day things like driving and high-fiving. What now? Once you stop crying, you need to decide what to do with that flappy bit of skin. Authorities (by which I mean folks on the Internet) disagree on what exactly to do in that moment after your skin has come away from your hand. Some suggest trimming the extra skin; others recommend taping it back down, still others suggest super glue. Do what you like, but be sure you clean the wound out thoroughly first (yeah, it’s going to hurt). Just like with anything else, listen to your body. Take the time you need to allow your skin to heal. You might even feel better after a week off – your body usually needs more rest than you give it. What’s your proven no-flapper method? What do you do when you feel that telltale ripping sensation? Do you use the superchalk? What’s your go-to flapper fixer? Let us know! 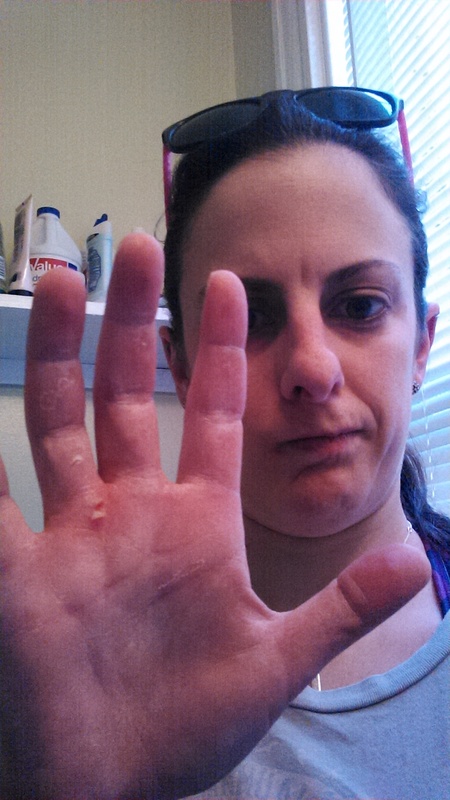 This entry was posted in Indoor Climbing, Wellness and tagged flappers, hands, workout. Bookmark the permalink.